Crown Industrial is your source for silent chain. Crown Industrial is your source for silent chain. We manufacture a complete line of inverted tooth chains, including silent chain and our Excel line of high performance chains. We produce the component parts, assemble the chain, inspect, and ship all of our inverted tooth chain products here, in our Cortland, NY factory. We sell direct from our factory, so regardless of whether you need a single strand for a repair or if you are a major OEM we save you time and money. Many standard products are in stock for immediate shipment, and we also have large component inventories on hand to provide quick assembly on many other products. We can also provide expedited production and delivery when you have a machine down and need to get running again. Our proven designs and strict quality control along with in-house manufacturing provide you with top quality products, which together with our factory-direct pricing gives you the best value in the industry. Our chain expertise extends beyond silent chain. We also can supply you with many types of specialty chain. We stock a vast array of ASME standard attachment chain components for rapid assembly – typically 5 working days or less. We can also modify components, or produce totally custom attachment and conveyor chain products to your specifications. 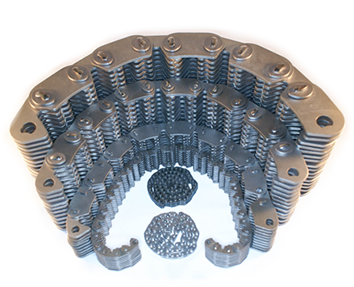 Through strategic partnerships, we also offer roller chain, leaf chain, sprockets, and complete chain cases. Because we are a chain manufacturer, we understand these products and have the capability to find the proper product for your application. We are here to support the products we sell. Whether it is application advice, product inspection, testing, or warranty support, we are here to support all the products we sell. So regardless of whether you need a single replacement chain for a piece of your equipment or if you are an OEM installing chain drives in your new equipment every day, contact us today for a quote or for more information about our products and services.